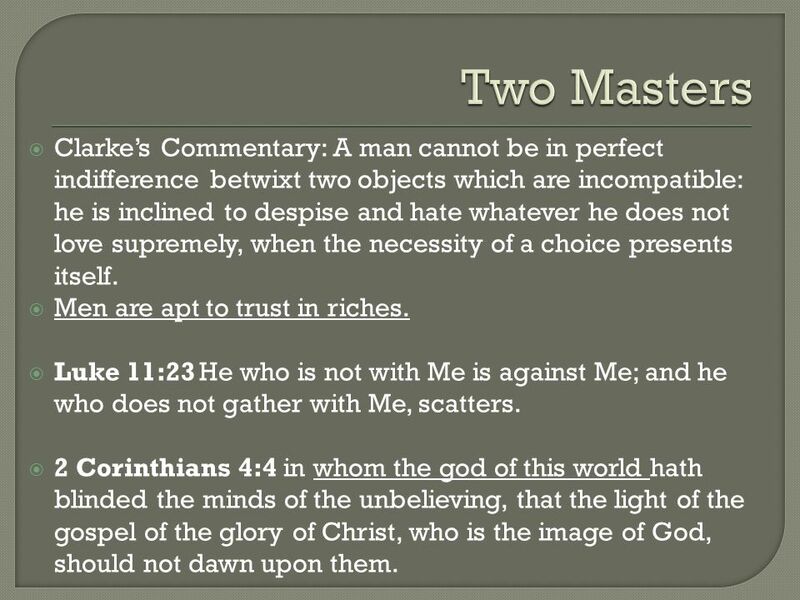 2 Matthew 6:24-34 24 No man can serve two masters: for either he will hate the one, and love the other; or else he will hold to the one, and despise the other. 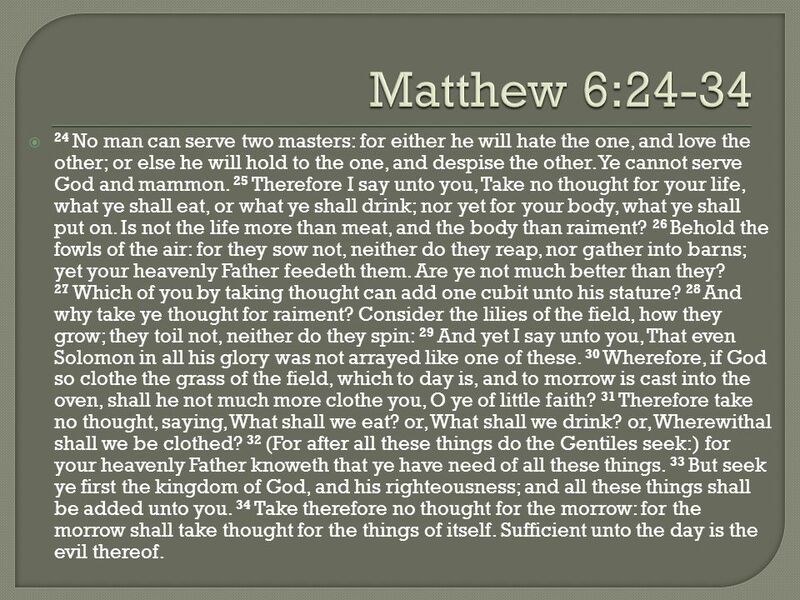 Ye cannot serve God and mammon. 25 Therefore I say unto you, Take no thought for your life, what ye shall eat, or what ye shall drink; nor yet for your body, what ye shall put on. 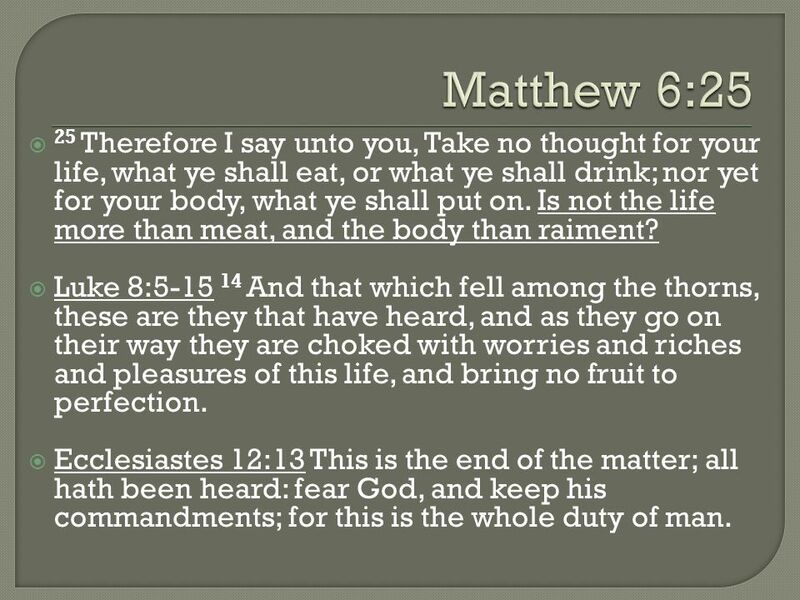 Is not the life more than meat, and the body than raiment? 26 Behold the fowls of the air: for they sow not, neither do they reap, nor gather into barns; yet your heavenly Father feedeth them. Are ye not much better than they? 27 Which of you by taking thought can add one cubit unto his stature? 28 And why take ye thought for raiment? Consider the lilies of the field, how they grow; they toil not, neither do they spin: 29 And yet I say unto you, That even Solomon in all his glory was not arrayed like one of these. 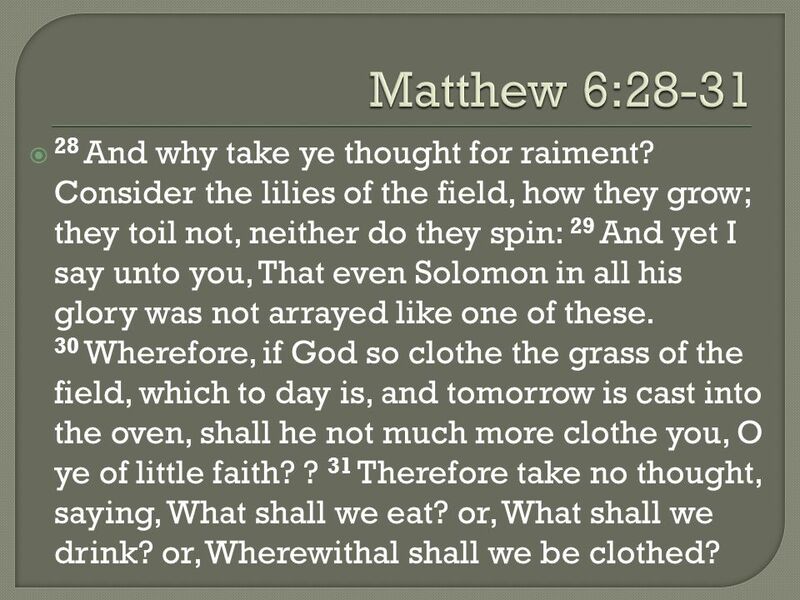 30 Wherefore, if God so clothe the grass of the field, which to day is, and to morrow is cast into the oven, shall he not much more clothe you, O ye of little faith? 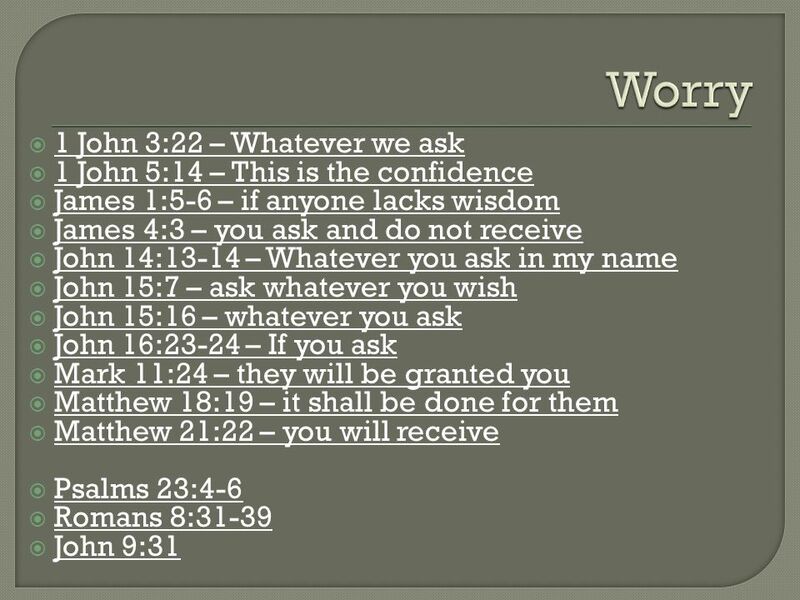 31 Therefore take no thought, saying, What shall we eat? or, What shall we drink? or, Wherewithal shall we be clothed? 32 (For after all these things do the Gentiles seek:) for your heavenly Father knoweth that ye have need of all these things. 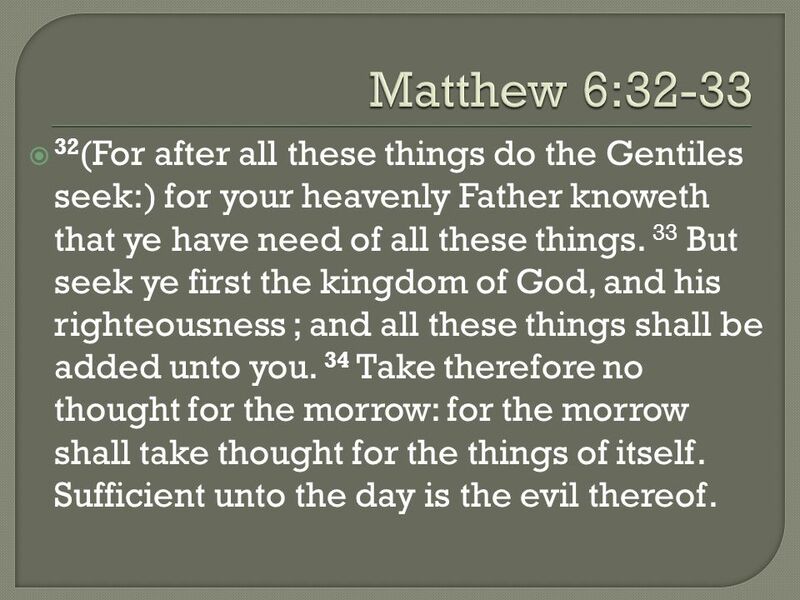 33 But seek ye first the kingdom of God, and his righteousness; and all these things shall be added unto you. 34 Take therefore no thought for the morrow: for the morrow shall take thought for the things of itself. Sufficient unto the day is the evil thereof. 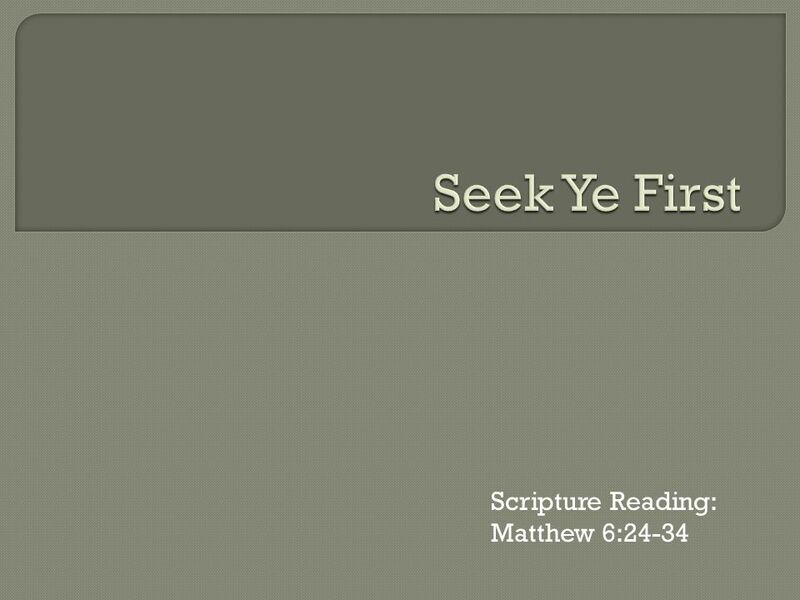 Download ppt "Scripture Reading: Matthew 6:24-34"
QUESTION NIGHT, August 15, What do we mean when we say Lords will be done? 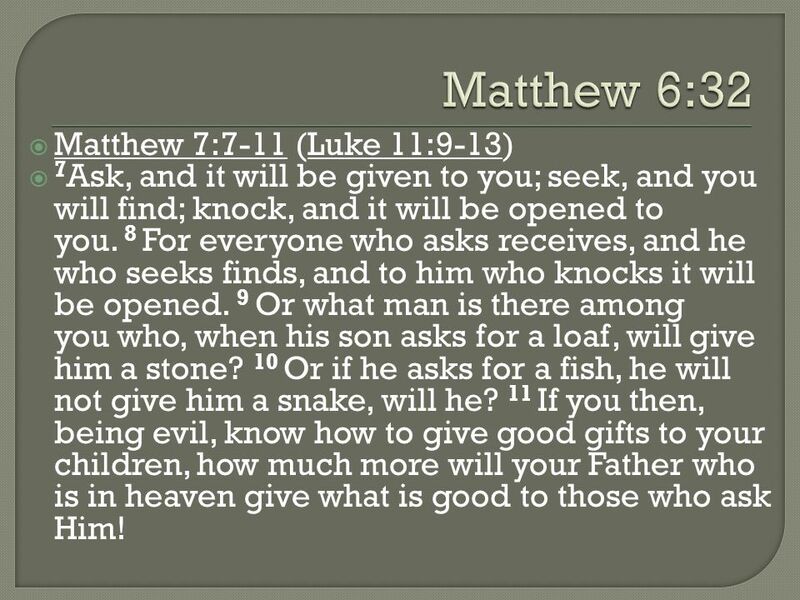 Is He in control of each occurrence of both good and evil? Matt. 6:10. `` Someone in the Crowd Luke 12:13-15 (ESV) 13 Someone in the crowd said to him, Teacher, tell my brother to divide the inheritance with me. Following Jesus The Red Letters Gabe Orea. XICF. 3 Aug XLVIII. 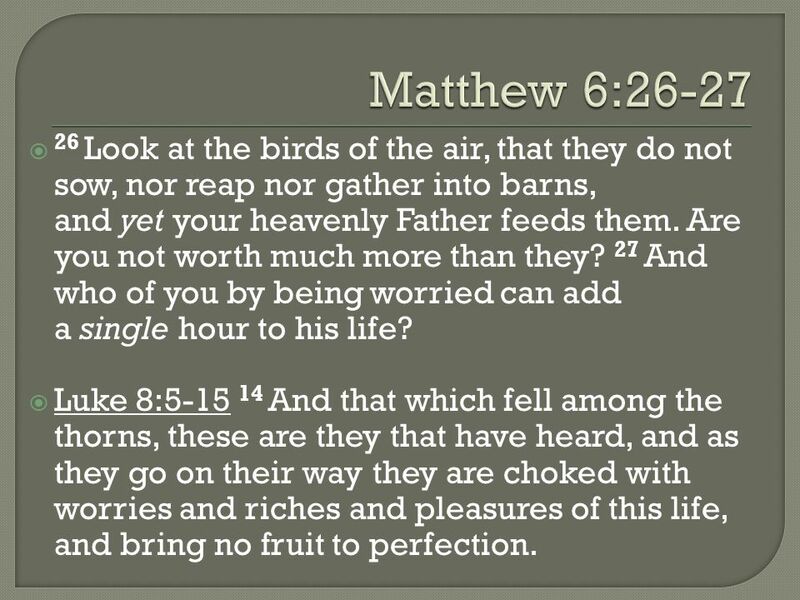 Living a Worry-free Life Matthew 6: Encounter with Death.  You have 10 minutes to rescue a few items from your house before you escape the fire.  What items will you take (besides family members and pets)? Isn’t There More to Life? The American Dream Faces Reality. The Lord Is My Shepherd Psalm 23.